One of the best ways to quickly give your car that 'professional detailed' look, is to clean the wheels and finish with the best tire shine. There are lots of different products to choose from, so it can be difficult to find the a tire shine and protector to suit your needs. A good tire shine will also protect your tires from the elements, and some can offer protection for a few weeks. Most can also be used on other trim and rubber parts. What are the different types of tire shine? Meguiar’s G7516 gives your tires a durable, dark, and glossy shine. Meguiar's say it will endure rain, snow, high summer temperatures and even car washes. This is a solvent-based tire gel that leaves a 'silicone-like' glossy finish on your tires. The finish should withstand heat, low temperatures, dust, and rain water. Compared to water-based tire shine products in this price range, the coating lasts longer and more effectively protects the tires from dust and stops them from turning brown. There are a lot of tire shine products on the market that simply don't last any more than a few days. In contrast, Meguair's Tire Shine generally gives a long lasting consistent shine. I find that a thorough wash before you apply this gel will make sure the final finish does not have lumps or contaminants. As it comes out of the bottle as a fairly thick gel, I usually apply it with a sponge or microfibre cloth. I like the fact that it is a gel, since this makes it easier to apply and you're less likely to get it onto the paintwork. In general, one coat gives a fairly deep shine for most car owners. But if you like your tires to be super glossy, then a top tip is to apply more coats. Just make sure to wait for about 10 to 15 minutes in between coats for maximum effect. It's also a good idea to wait for the final coat to dry before driving. In normal conditions (not too hot or excessively wet) the finish can last for about 2 weeks, which isn't bad. In my experience, the gloss finish won't last any more than a few days, but the tires still look black and clean for a couple of weeks. If you like the smell of grape flavoured candy, then this tire shine is right up your alley! It's kind of a strange smell for a tire shine, but makes applying it a more pleasurable experience! Whilst it's easy to apply, smells nice and leaves a nice gloss finish but it's not the longest lasting tire gel on the market. You'll probably get away with applying it twice a month, and may get better results depending on the weather. Some people prefer spray on tire shine for convenience, so this particular one may not be for them. Overall though, it's a decent tire shine product and comes with the assurance of quality because it's made by Meguiar's. 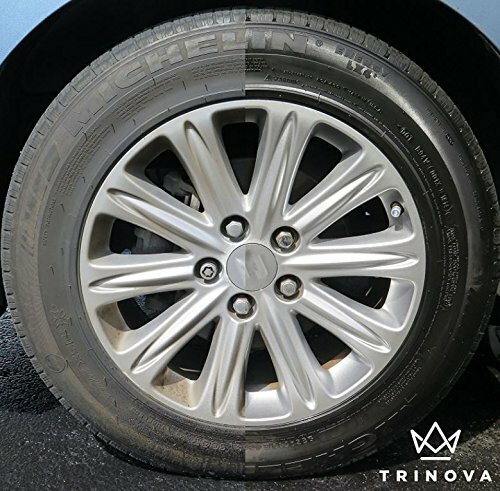 If you don’t like too much gloss on your tires, then the water-based Trinova Tire Shine is worth checking out. 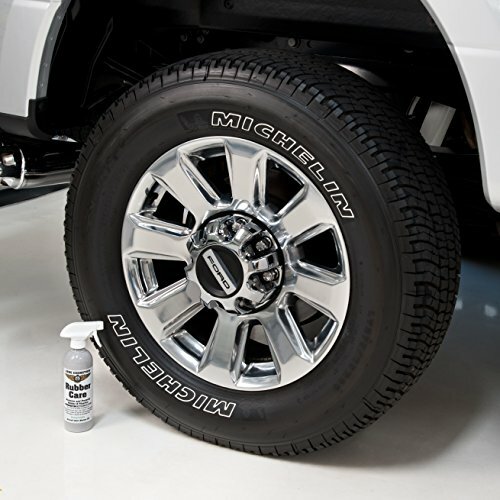 This is a water-based protectant that absorbs into the tires leaving them with a wet look. Because it's water based, it comes straight off when you wash your tires, leaving no residue, unlike most silicone based dressings. So the original rubber composition of the tires stays intact but with an added layer of temporary protection. Also, since it's a water-based dressing it quickly dries to the touch, so there's less chance of it getting onto the wheels or paintwork. Along with keeping the shine on newer tires, it's also good for protecting aging tires. 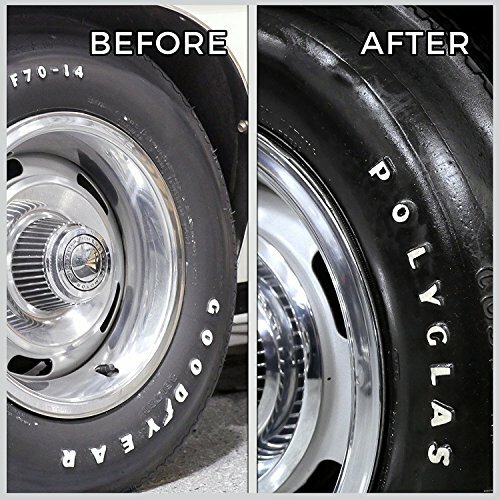 It claims to cover up small thread cracks, faded tire walls, and brown spots with a single coat. It can also help to keep your tires clean by repelling some dirt, dust and sand. Some detailing pros don't like water based products because they don't last as long as solvent based alternatives. But there are many other factors that can affect the longevity of a detailing product such as weather and temperature. I like water based products because they are PH neutral, so they won't harm your driveway or the environment. They are also easily removed if you want to re-apply a fresh coat. To apply, just spray it on the tires and leave them to dry for around 3 to 5 hours. I find the longer you let it dry for, the better the shine. Sometimes I even let it sit overnight. If you apply multiple coats, you'll get a deeper shine. You'll need a good quality spray bottle that can mist well to get the best results from this product. Remember to clean your tires before you apply the product as this is a tire shine, not a tire cleaner. And when you're done, wipe any excess product from the rims. Whilst it provides a resilient temporary protective coat that protects tires from drying out, it's not going to be as hard wearing during extreme winter driving or on wet days. It also takes a lot longer than some others to dry out completely, so don't expect great results in 10-15 minutes. 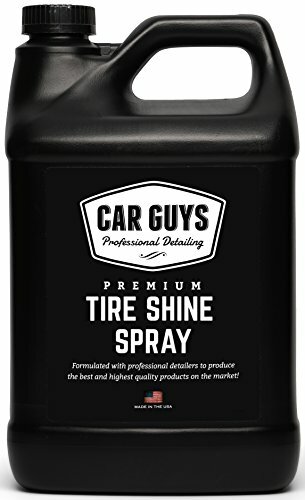 CarGuys Tire Shine is very well known among car enthusiasts and detailers. This is because, not only does it make your car tires shiny, it's also a UV protectant with patented polymer additives that are supposed to increase longevity and performance. CarGuys Tire Shine is made from a patented water-based polymer formula, that effectively bonds with your tires to give them a black wet shine. It's PH neutral, nontoxic and environmental friendly. Along with reviving your tires and giving them a glossy new look, the coating that it puts on is UV resistant. So it protects the tire walls from cracking caused by direct sunlight exposure. The best way to apply it is by using a spray bottle. 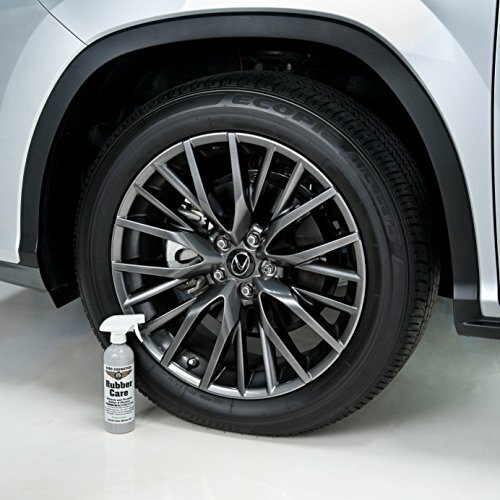 Simply fill the spray bottle with the liquid from a can and spray it directly onto the tire walls. 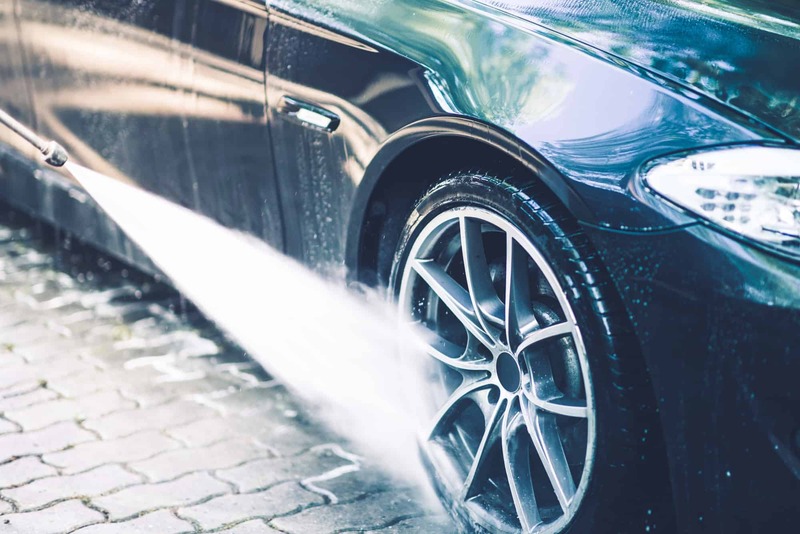 As it's water based, if you get some on the wheels or the paintwork of the car, you can wipe it off with a clean damp cloth to completely remove it. If you miss a bit, it won't harm the paint. You can also apply it using a sponge, but it's not as effective and you'll probably end up using a bit more because the sponge tends to soak up a good amount. You should find that the first coat gives your tires a deep rich satin finish. A second coat gives them a semi-gloss finish. While the satin finish stays on for about 2 weeks, the gloss tends to go away after a few days. Because it's a water based tire protector, it's not going to leave any oily residue and should dry out fairly quickly. The downside is it's not going to last as long as a solvent based protector, especially in rainy conditions. I found it also doesn't give a real wet look, rather a clean satin finish. Extra coats will give you more gloss, and you can easily top up the finish with an extra coat after a few days if you want. Chemical Guys Silk Shine isn't just a tire shine and protector, it can also be used on pretty much any interior or exterior rubber, vinyl and black plastics. It provides UV protection and can restore the look of tired sun damaged plastics with minimal effort. 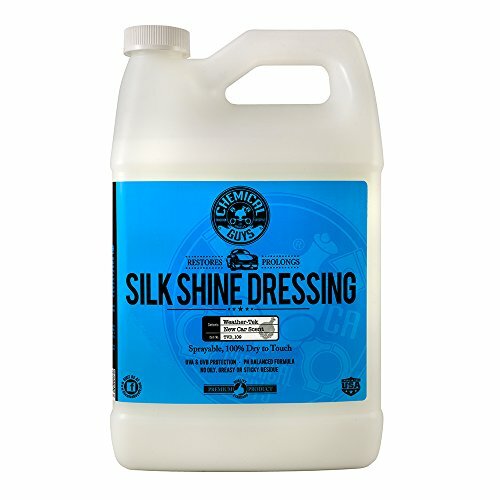 Silk Shine is a water-based detailer with patented Weather-Tek technology to help it last longer. It also contains sun blockers that can help shield from UVA and UVB rays. Along with UV protection and a glossy finish, Silk Shine also acts as a dust and dirt repellant. The film of protectant it leaves behind repels dust while it keeps the surface smooth and non-sticky. Because it's non corrosive and PH neutral; it protects the tire from rot caused by heat and direct sunlight. It dries out smooth and non-sticky, with a satin to light gloss finish. Car Guys claim it will hold out even in snow, high humidity and rain, direct sun and high heat. I haven't tested it in all conditions, but it does hold up fairly well in rain when applied to tires. Application is as straight forward as it gets. Take a microfiber cloth, spray the liquid and wipe the surface with it. Some prefer to spray directly onto the surface. This works equally well but it can lead to over sprays if you're not careful. In saying that, a good thing about this detailer is that even if you do overspray, it won't damage paintwork or metal trim. Since it's a water-based protectant, I found that cleaning and drying the tires or trim thoroughly before you apply it is really important. Otherwise, dust and dirt in the tire can form lumps and you won’t get the best results. Chemical Guys Silk Shine is one of the best all round tire and trim products you can buy. It's easy to apply, it's safe to use on most surfaces and it should last a couple of weeks in most cases. It's hard to say anything bad about it. Other reviewers have had mixed results, saying it did not last very long especially when driving in the rain. Unfortunately, this may be true. As it's a water based product it's not going to be as resilient as a solvent based alternative. 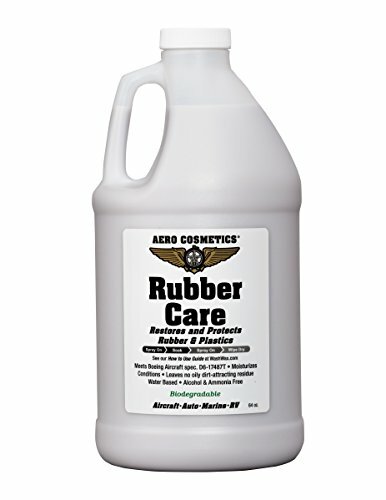 Formulated to D6-17487T Boeing standards, Aero Cosmetics Tire dressing is one of the best tire dressings for all tire types. It leaves behind a dark satin finish, that protects from UV rays and won't attract dust or dirt. This is another water based product that dries out matte and doesn't leave any oily residue. It also contains triple nano polymer technology that helps to protect tires and trim from UV rays. Originally formulated to D6-17487T Boeing standards, you can expect it to be hard wearing and offer better UV protection than most of it's competitors. This tire shine does not leave behind a wet look, so if that's what you are after then you'll have to look elsewhere. It can be used safely on tires, vinyl, plastic and rubber trim surfaces, interior and exterior. Before you apply, it's important that you clean and dry the tires (or trim surface) thoroughly. I'd recommend you use a good tire soap, shampoo or cleaner. Let the surface dry out completely before you apply the protectant. To apply, just spray it directly onto the surface. You need to let it sit for 30-60 minutes, depending on weather conditions. Once it has dried in, then wipe off the excess if there is any using a soft cloth. The dressing should last for about at least a week, if not longer (assuming you aren't driving in really bad conditions). If you use it properly, and have realistic expectations, then this is a great tire restorer and protector. One downside, is the application process. The tires/trim need to be cleaned thoroughly before you start, then you need to wait for up to an hour for it to soak in. If you are patient and willing to follow the instructions then this is the tire shine for you. If you are in a hurry, then you may be better off choosing a different one. Most tire shine products are trying to achieve the same results: dark, glossy tires. But not all tire shine products are the same. Here's a few things to look out for to help you choose the right one for you. ​Not all tire shine will give you the same type of finish. Some dry out matte whilst others dry out glossy. Some can also get glossier the more coats that you add. 2. Solvent or Water Based? ​It's important to choose detailing products that don't harm the environment, and that won't damage your car. Tire shine can be solvent based or water based. I generally go for the water based products because they are less toxic and won't damage you or your car. ​Some tire shine is applied using a sponge or applicator, and some is applied using a spray bottle. It all depends on the consistency of the product and if it is a gel or a liquid. Just remember you may need to purchase a spray bottle if you are buying a larger gallon sized bottle. 4. Can it be used on Trim and rubber too? 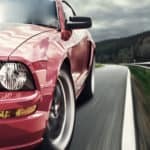 ​Most tire shine products can also be used on plastic trim, rubber, window seals, engine covers and hoses and even on leather (although I wouldn't recommend using on leather). If you are looking to restore or protect other parts of your car then you can save a few dollars by buying a tire shine that does it all. 5. Does it Provide Other protection? 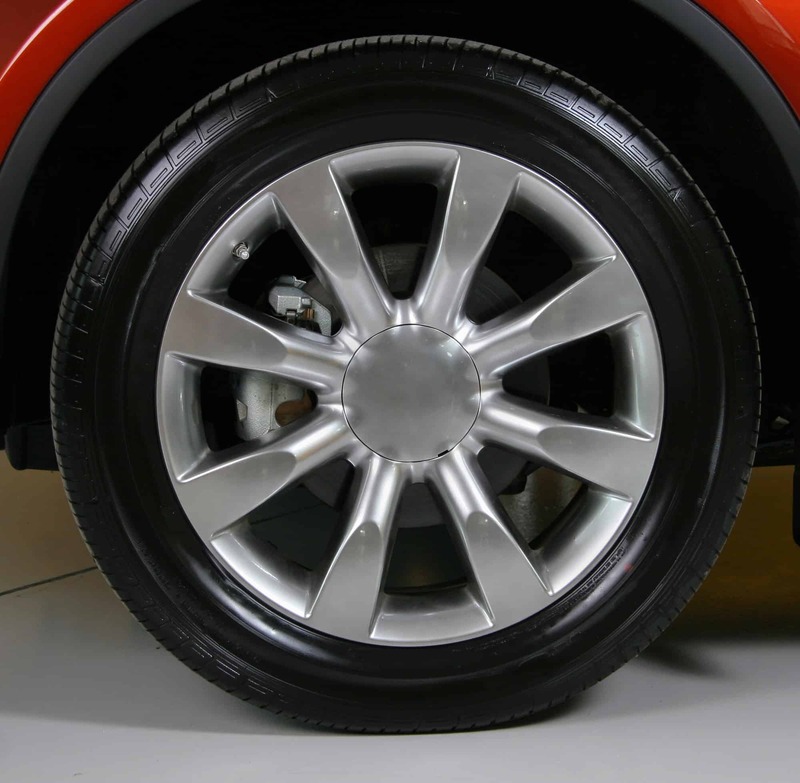 ​Along with providing a glossy, wet finish; tire shine can also protect and restore. Most will provide some sort of UV protection, to help prevent cracking and discoloration. Tire shine will not only revive dull, faded tires it will also help to protect them from the weather. 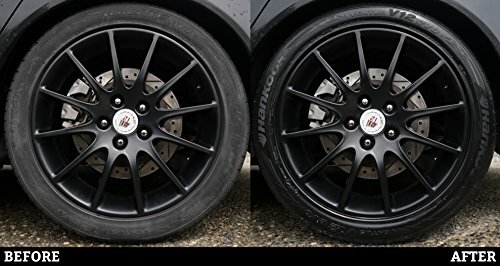 Tire shine will give your tires a deep, black finish and depending on which one you choose this can be matte or glossy or somewhere in between. 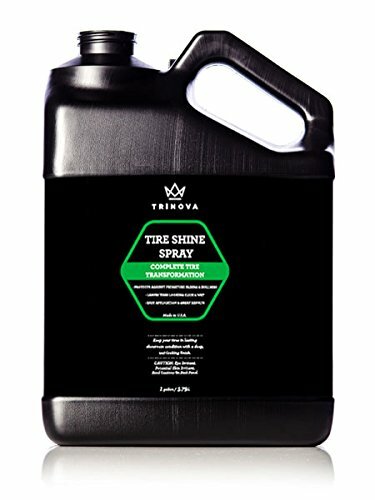 Tire shine can be bought as a spray or as a gel. The only real difference between the two is the way it's applied. Obviously the gel has a thicker consistency, so you apply it using a tire sponge or a cloth. You get the same results from both, although the spray can be messier if you don't use a good misting bottle. Most tire shine products are water based these days. These are generally more environmentally friendly, and won't damage your car either. Solvent-based tire shine usually lasts longer (because it's more difficult to remove) , but you need to be more careful where you use it so as not to cause damage. Just like any other detailing job, the key to great results is in the preparation. Before you can apply tire dressing to tires or trim, you need to be sure that the surface is clean and dry. Clean the tires - Get yourself a good quality tire brush and scrub the tires with cleaner and water until all of the dirt is gone. Dry the tires - Rub down the tires with a clean, dry microfibre towel to remove excess water and to make sure all of the dirt is gone. Now leave the tires to dry for at least 30 minutes, so that they are fully dry. Apply the tire shine - Using an applicator sponge, a cloth or spray bottle; apply the tire shine to the tire. Make sure you stick to the manufacturer instructions and remember less is more, you can always apply a second coat or touch up if necessary. Let the Tire Shine Dry - This is the important step. It can take from a few minutes to a few hours. With some you get best results if you leave overnight. Wipe off excess Tire Shine - Once it has dried in, wipe off any excess tire shine to prevent sling off on paintwork when you start driving. In our opinion, the best all round tire shine has to be the Chemical Guys Silk Shine. It can be used on lots of different surfaces and is easy to apply and leaves a glossy protective finish.